The Calais "jungle camp" developed into a small town before being demolished. 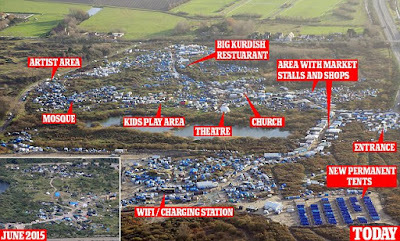 Lord, today we pray for the refugee crisis in Calais, France. Lord, what tension—thousands of desperate migrants making illegal homes with the hopes of stowing away to the UK, long-term residents resenting the sea of squatters and the increasing crime. Lord, you know our emotional, volatile hearts. You see our desperation, rage, hope and hopelessness. You care deeply about each and every person involved in this situation—you know the number of hairs on each head. We pray for the migrants to find safe places to stay, where they will be welcome and legal. We pray for the police officers, who deal with the issues stemming from the refugee crisis every day. We ask your blessing on those who are loving their neighbors as themselves in this situation. And we ask for peace for those who want their “normal” lives back. Give the leaders of Calais wisdom as they discern what is best for everyone involved. In Jesus’ name we pray, amen.